By Costa Maragos Posted: March 29, 2017 6:00 a.m.
What were once bare walls have now been transformed, featuring the bold and vibrant works of original artists. The works of five student artists are now on display at the Archway Gallery, a brand new exhibition space located on the main floor of the library. 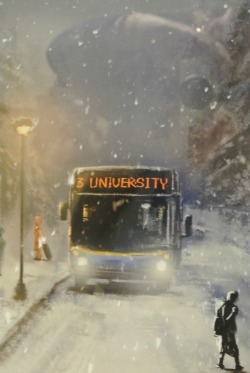 “University Bus” by Jingyu (David) Zhang. The library asked for submissions. “It’s been fantastic. There’s been a great response so far,” says van der Ven. 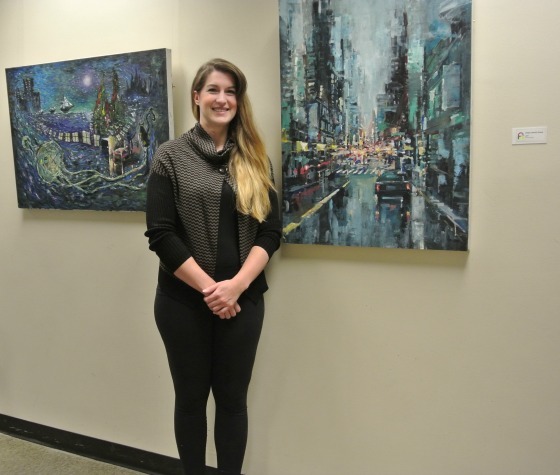 Brittany Gillies, from Bengough, Saskatchewan, is in her final year of the bachelor of fine arts program majoring in visual arts with a focus on drawing. Stephanie Hasiak is enrolled in the BFA program, majoring in ceramics. Seila Stoffel is in her second year of the BFA program. She’s returned to the U of R. She studied under internationally-known artist and professor Vic Cincansky in 1988 at the College Avenue Campus. Nic Wilson is from Fredericton, New Brunswick. He is attending the U of R for his MFA in visual arts. Jingyu (David) Zhang is from Guangdong, China. He is studying in the department of visual arts BFA program. 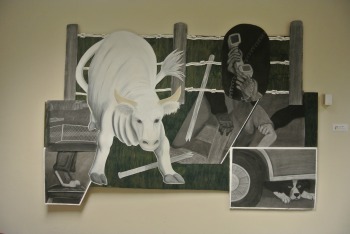 “The Bull in the Yard” by Brittany Gillies. For this first display, the library teamed up with the Faculty of Media, Art, and Performance. New art will go up each spring, fall and winter semester and all students are encouraged to submit their works. “Students have been ecstatic to be able to display their art somewhere and get exposure,” says van der Ven. “We want to make the space more lively. A space that’s designed by students that is most inviting for students to study."